Are you looking for an epic breakfast idea? 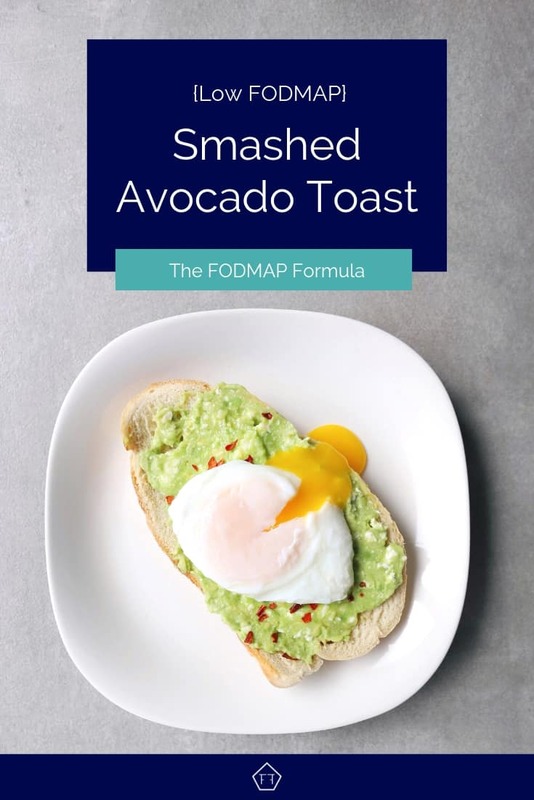 Unleash your inner foodie with this quick and easy low FODMAP smashed avocado toast! Whether you’re serving up brunch or enjoying a meal for one, this is the breakfast of champions. As a millennial, I’m almost ashamed to say I took a long time to get onboard the smashed avocado toast train. It seemed like sooo much work mashing up an avocado for breakfast. What do you do with the leftover avocado? And how far can 1/8 of an avocado really spread on a piece of toast? First of all, I was right; trying to spread 30 grams of avocado on a piece of bread is spectacularly difficult. So I threw in a bowl with some lime juice and a bit of feta cheese and mashed it. After that, it spread like magical butter. As for the poached egg, while it’s still not my favourite, I think I’m warming up to it. I’ll admit poached eggs do have a nice silky flavour, but I think I might need to try it a few more times before I’m sold. Heads up, if you don’t have time to poach your egg you can always fry it (I won’t tell, promise). Happy brunching! 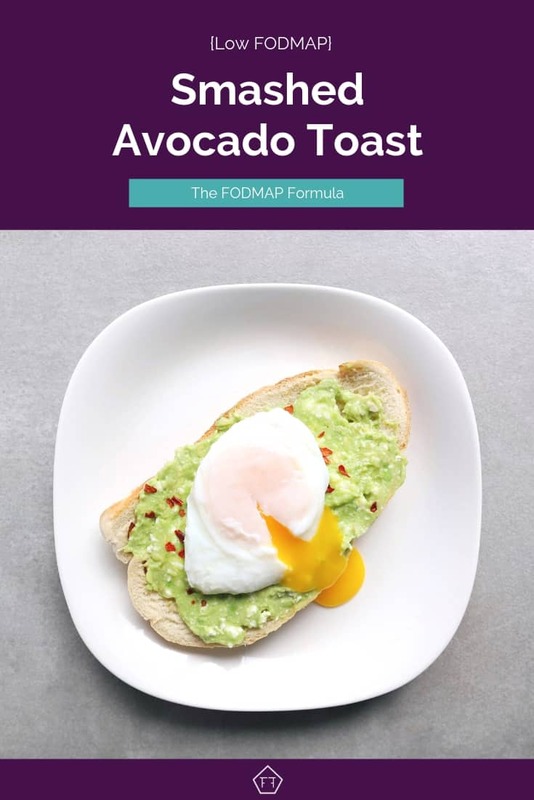 Think this low FODMAP smashed avocado toast sounds great, but you don’t have time to try it now? Don’t worry! You can PIN THIS POST for later. Ready to get your brunch on? This low FODMAP smashed avocado toast is calling your name! Check out the notes below for tips on keeping this recipe FODMAP friendly. First up, bread! You have a few options here. I like making my smashed avocado toast on low FODMAP sourdough bread. According to the Monash app, wheat or spelt sourdough bread is low FODMAP in servings of 2 slices (52 g) per sitting. Though, Monash doesn’t list a maximum serving size, large servings of sourdough bread are high in the FODMAP fructan. You can also use gluten-free bread if that’s what you have kicking around. Monash lists the same serving sizes for gluten-free bread – 2 slices (52 g). You can also try it with regular white bread. According to the Monash app, white wheat bread is low FODMAP in servings of 1 slice (24 g) per sitting. Servings of 1.5 slices (36 g) are high in the FODMAP fructan, so don’t go crazy! We’ll also be using avocado. Monash has determined avocado is low FODMAP in servings of 1/8 of an avocado (30 g) per sitting. Servings of 1/4 avocado (45 g) or more are high in the FODMAP sorbitol. Our recipe uses 1/8 of an avocado, which is within Monash’s recommended range. This recipe also uses feta cheese. According to Monash, feta cheese is low FODMAP in servings of 3 tbsp per sitting. Though, in the notes section, Monash clarifies that feta cheese only has trace amounts of FODMAPs. So, it’s suitable to eat in larger servings (from a FODMAP perspective). We’ll also be using lime juice. Monash has said lime juice is low FODMAP in servings of 1 cup (250 g) per sitting. Servings of 1.5 cups (300 g) or more are high in the FODMAP fructan. Our recipe uses 0.5 tsp of lime juice which works out to 0.0052 servings of lime juice per sitting. That means this serving won’t likely contribute anything to your FODMAP load. You’ll also need some sliced tomatoes. For this recipe, we’ll be using common tomatoes. According to the Monash app, common tomatoes don’t have any FODMAPs so they won’t contribute to your FODMAP load. Last but not least, eggs! 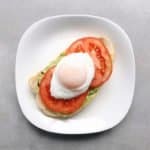 Since eggs are a protein, they don’t have any FODMAPs. That means the crowning jewel of our smashed avocado toast won’t add anything to your FODMAP load. Since low FODMAP foods can stack up, let’s do some FODMAP math so you can see what you’re eating. 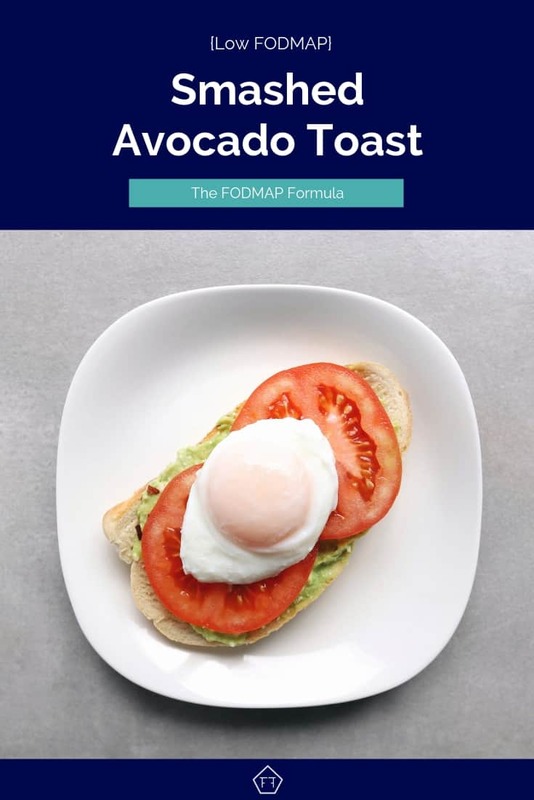 Want to try this low FODMAP smashed avocado toast? Don’t forget to PIN THIS RECIPE for later! 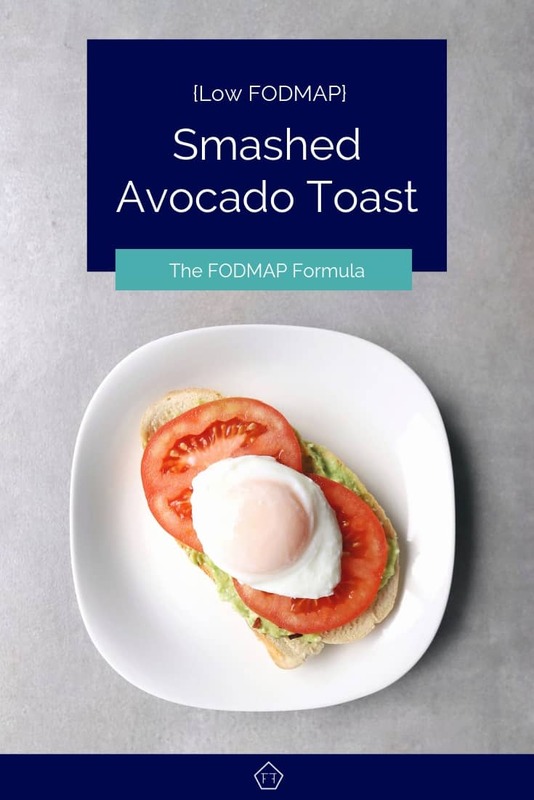 Unleash your inner foodie with this classic low FODMAP smashed avocado toast. Happy brunching! Place your avocado, feta, and lime juice in a small bowl and mash together with a fork until silky. Spread onto toast and sprinkle with salt and chili flakes. Top with tomatoes. Place your egg in a cup or small bowl. Bring a small pot with 2" of water to a boil, then lower the heat to a simmer (a small bubble every few seconds). Stir the water in the pot with a slotted spoon, so the water creates a funnel in the centre of the pot. Drop your egg into the centre of the funnel and let it cook for 3-4 minutes, then remove it with the slotted spoon. Pat the egg dry and pop it on your toast. Enjoy! 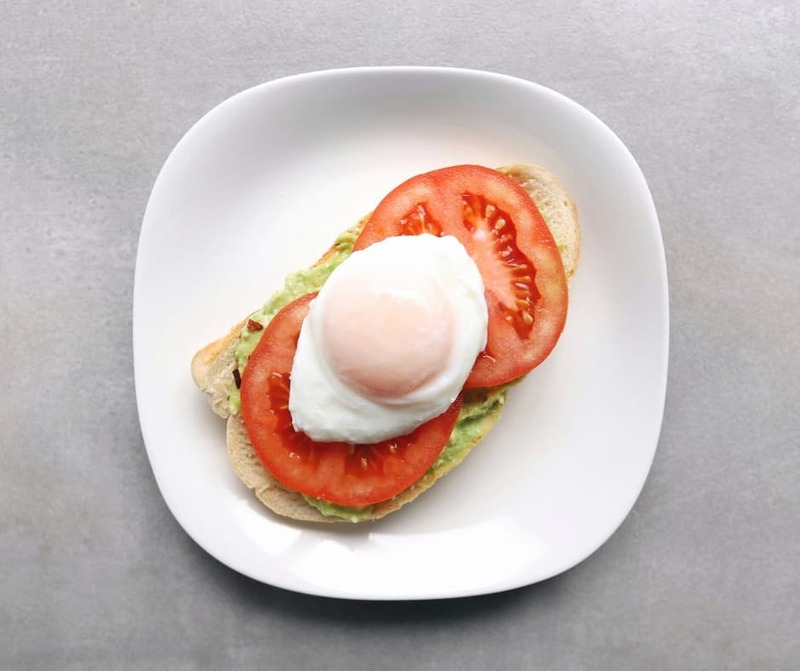 This low FODMAP smashed avocado toast will get you brunch ready in no time! Did you like this recipe? Don’t forget to share it! Together we’ll get the Low FODMAP Diet down to a science! Low FODMAP French Toast Have a hankering for a breakfast classic? Get your brunch on with this spectacular make-ahead french toast! Low FODMAP Sourdough Waffles Looking for a fun FODMAP-friendly twist on a breakfast classic? Take your brunch to the next level with these easy make-ahead low FODMAP sourdough waffles! Low FODMAP Raspberry Muffins Looking for an easy make-ahead breakfast idea? These raspberry muffins are so light and fluffy, no one will guess they’re low FODMAP! Hi Amy. Thanks for this recipe. I am going to omit the egg . I not an egg person. I made it before but just using avocado and tomatoes. I have to try the feta cheese. Thanks for the recipe and email. My husband isn’t an egg person either, so I totally hear you! The feta cheese makes this taste like magic!! Let me know how it goes when you try it.